The Now SMS & MMS Gateway can use a GSM/GPRS modem to send and receive MMS messages via an operator MMSC. In this type of configuration, there is no special setup requirement required by the mobile operator. The Now SMS & MMS Gateway sends and receives MMS messages using the same protocol that is used by the MMS client in a mobile phone, so it simply requires that the SIM card in your mobile phone be provisioned by your mobile operator for MMS support. It is also helpful to have an MMS compatible mobile phone that is already configured to send and receive MMS messages via the operator MMSC. In this way, you can check the settings on the mobile phone to determine the correct settings to configure in the Now SMS & MMS Gateway to allow the gateway to connect to your operator MMSC. 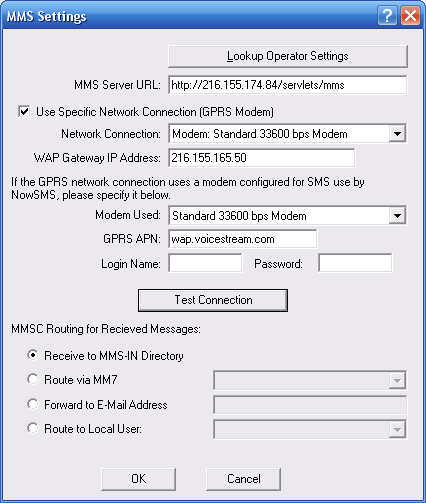 In this scenario, when sending an MMS message, the Now SMS & MMS Gateway initiates a GPRS connection to the mobile operator, it then makes a connection to the operator WAP gateway, and submits the MMS message over this WAP and GPRS connection to the mobile operator’s MMSC. When receiving an MMS message, the gateway first receives an MMS notification message via SMS. When this special notification message is received, the gateway initiates a GPRS connection to the mobile operator, and a connection to the operator WAP gateway over GPRS, in order to retrieve the content of the MMS message from the mobile operator’s MMSC. There are two areas where MMS settings specific to using a GSM/GPRS modem are specified, one is specific to sending messages, and the other is specific to receiving messages. 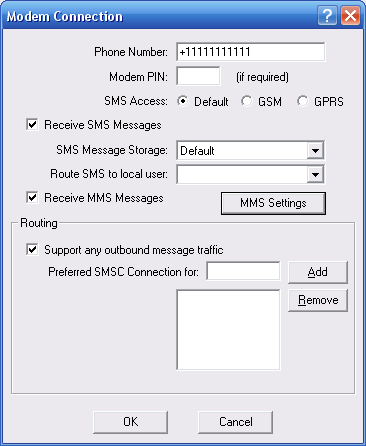 To send MMS messages to an operator MMSC via a GPRS modem connection, please see the description below for Connecting to an Operator MMSC – Sending MMS Messages. This section focuses on setting for receiving MMS messages over a GPRS modem connection. When a GSM phone or GSM modem receives an MMS message, what it actually receives is an MMS notification message. The MMS notification message arrives via an SMS message (usually two concatenated SMS messages). The MMS notification message contains header information about the MMS message, plus a URL pointer (e.g., http://host.name/path/file.mms) to the actual MMS content. In order to receive the MMS message, the receiving device must initiate an HTTP connection to retrieve the URL with the MMS message content (this URL generally points to content residing on the operator MMSC). In earlier releases of the Now SMS & MMS Gateway, when the gateway received an MMS notification message, it would always attempt to retrieve the MMS message content via HTTP over the default internet connection of the PC running the gateway software. While this worked for some installations, this did not work for retrieving MMS message content from many operator MMSCs. The reason that it would not work in many installations is that the operator MMSCs were either firewalled off so that they were inaccessible from the internet, or they were on private IP addresses within the operator network. The v5.0 release of the Now SMS & MMS Gateway includes configuration options that allow the gateway to automatically initiate a GPRS connection when an MMS notification message is received. Rather than retrieving the MMS message via HTTP, the gateway can make a connection to the operator WAP gateway to retrieve the MMS message content from the MMSC through the WAP gateway using WAP protocols. As almost all MMS compatible phones issue their MMS requests through a WAP gateway proxy, this allows the gateway software to appear just like a standard MMS compatible phone. Note that you can still not use an MMS compatible phone as a GSM modem if you want to be able to receive MMS messages through the gateway. This is because an MMS compatible phone intercepts the MMS notification and tries to process it automatically, never forwarding it to the gateway. You must use a GSM/GPRS modem device to take advantage of this feature. Before continuing, you will need to determine the GPRS APN (Access Point Name), the IP address of the WAP gateway, and the MMSC Message Server URL that are used for sending/receiving MMS via your operator network. These settings are operator dependent, and it may be advisable to check the MMS configuration settings on a working mobile phone to determine the correct settings. Note that your mobile operator possibly has multiple GPRS APNs and multiple WAP gateways, and you need the settings that are appropriate for MMS, not for WAP browsing or general internet connectivity. With most GSM/GPRS modems (except for some PC card modems that allow GPRS access through a network connection without using dial-up networking), NowSMS cannot simultaneously use the modem for both sending/receiving SMS messages and accessing GPRS data. From the “SMSC” page of the Now SMS & MMS Gateway configuration dialog, highlight a connection for which you want to configure settings for receiving MMS messages, and select “Properties”. The screen that is displayed will vary depending on the type of SMSC connection selected. But for any of the types of SMSC connections that can receive SMS messages, there will be a check box for whether or not the gateway should attempt to “Receive MMS Messages” for MMS notifications received via that SMSC connection. To configure the “MMS Settings”, ensure that “Receive MMS Messages” is checked, and then select the “MMS Settings” button. The “MMS Settings” dialog specifies how to receive MMS messages associated with any MMS notifications received over the SMSC connection. The “Lookup Operator Settings” button will pre-load MMS settings for selected mobile operators. The “MMS Server URL” is the URL address for the operator MMSC. While this setting is primarily used when sending MMS messages, the gateway will acknowledge MMS message receipt to this URL, and in many cases, if the operator MMSC does not receive this acknowledgment it could continue sending the same message repeatedly, or delay the sending of future MMS notifications. If the MMS message content needs to be received over a specific network connection, such as a GPRS modem, check the “Use Specific Network Connection (GPRS Modem)” checkbox. The “GPRS APN” field specifies the GPRS Access Point Name (APN) to be accessed for connecting to the MMSC. This setting is operator dependent, and it may be advisable to check the MMS configuration settings on a working mobile phone to determine the correct settings. Note that your mobile operator possibly has multiple GPRS APNs and multiple WAP gateways, and you need the settings that are appropriate for MMS, not for WAP browsing or general internet connectivity. Note that this setting is only available when using a Network Connection of type “Modem:”. For other connection types, the GPRS APN must be configured for the connection using some means external to NowSMS. When the Now SMS & MMS Gateway receives an MMS message, four options are available for processing the received message.